I am 34 weeks and 2 days with twins. This pic was taken yesterday. My growth scan yesterday estimated the babies weights to be 5lbs 6oz and 5lbs 14oz. 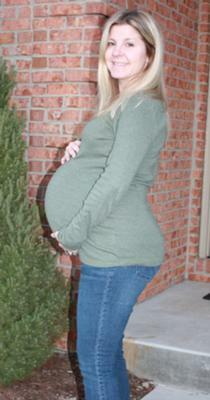 I feel pretty great and hope to make it to my scheduled repeat c-section at 38 weeks and 2 days (March 31, 2011)! We never found out the gender so we will get a double surprise at delivery! I can only hope to look as good as you when i'm that far along! I bet you are so relieved to have your babies out and healthy! I am 18 weeks along with boy/girl twins. Good job and congratulations! I delivered the babies at 36 weeks 6 days. Liam (6lbs 11 oz) and Sophie (6lbs 4oz). They are great babies just like their sister was!